St Hippolyte-du-Fort is a small town on the Vidourle river about 50 km northwest of Nîmes. Sitting on the southern edge of the mountains and forests of the Cevennes, St Hippolyte built a fort at the start of the 18th century for the Camisard War (French and Provencal History). Features of St Hippolyte-du-Fort include a large number of sundials (20th-c) and ancient fountains. Many of the houses are 17th-18th century. St-Hippolyte-du-Fort is located on a road that goes northwest from Nîmes, via Quissac and Sauve, into the Cévennes National Park.  Market day Tue, Fri. The town has many 17th-18th century houses. We especially liked the Rue de l'Amiral Sap, lined with the old buildings and many of the original doorways, with picturesque wooden doors and wrought-iron trim. 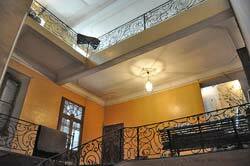 We were invited inside one for a brief look at the high central area with winding stone steps and iron-work railings. The town hosts a reasonable number of cafés, restaurants and shops. Just west of the center, the large quadrangles Casern building is a reminder of the area's military past. It was built in 1725 to house the troups of Louis XV. 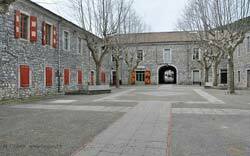 IN 1860 it became a garrison for the troups of Napoleon III. A military academy was founded here in 1886, and remained active until 1934. The casern is no longer military, but has a lovely interior space to walk through. The western side of building houses the Office de Tourisme, the Silk Museum, and a very good pizzeria-restaurant. Approaching St-Hippolyte-du-Fort from the south you drive through failrly flat, but natural, garrigue, with glimpses of hills beyond. Arriving at the town, you would expect to see a cluster of ancient stone buildings backed by the hills of the Cévennes. Instead, the view of the village is blocked by a huge, slab-sided supermarket, with the gigantic welcoming letters "SUPER U". We found this to be a very unfortunate first impression of St-Hippolyte-du-Fort. River Town. The Vidourle river begins in the Cévennes just before flowing down past St-Hippolyte-du-Fort. It continues southeast and south, past Sauve , Quissac and Marsillargues, and finally reaches the Mediterranean near Aigues-Mortes. The Argentesse river flows along the south edge of the town, passing just below the Temple and beside the ancient Fort, before joining into the Vidourle. 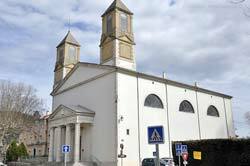 The Reformed Protestant temple of St Hippolyte-du-Fort is the largest in France. It was built in 1822 and restored at the end of the 20th century. Its organs were installed in 1853. Saint Hippolyte-du-Fort has 17 fountains dating from the 17th century. 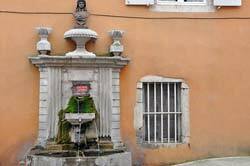 Nine of these old fountains are in the central village area, from Rue du Cap de Ville at the north to the D999 on the south side of the bridge at the south. One of the fountains is inside the Fort (open for visits during the week). The Marianne fountain (left) is located on the Rue de l'Argenterie. A lovely cascading fountain [Photo-08] is on the Bvd du Temple, and there's a large stone fountain with stone-face spigots [Photo-09] in the very center, Place de la Canourgue. A Sundials (Cadrans Solaires) project was started in Saint Hippolyte-du-Fort in 1983, and many were built over the following decade. The Office de Tourism has a map of two dozen of the sundials around the village. Taking the "Sundials Tour" is not only a way to see so many of these ancient time-pieces, but a great way to visit and discover the village. This wisteria (fleur de glycine) borderd sundial is at the Place de la Canourgue, above the Bar du Printemps. Many of the Saint Hippolyte-du-Fort sundials are painted on wooden panels, and not all of them have been well maintained over the years, so the current quality is variable. Most of them, regardless of condition, show a wide variety of imagination in their creation. 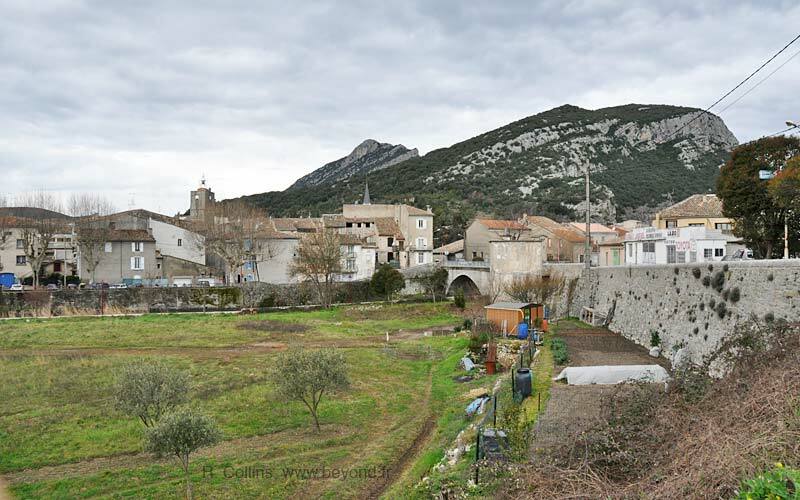 The original name of the village was Saint Hippolyte de la Rochefourcade, and was located about 3 km SW of the current site, just southwest of the small hill called Puech de Mar. A few ruins of the ancient village and chateau ruins can still be seen there. When the village moved to its current location beside the river, it was named Saint Hippolyte de la Planquette. A fort was built here in 1687-1689, and the village renamed Saint Hippolyte-du-Fort. IGN (1/25,000) #2741 ET "St Hyppollyte-du-Fort, Anduze, St-Jean-du-Gard"
The main, marked hike at Saint Hippolyte-du-Fort is a 17-km (5h30) loop called Le Chateau de la Roquette. Starting at the Place du 8 Mai (near the tourist office), the trail goes north over the river and follows the D39 road along the east bank. It then makes a large clockwise loop through the hills, with a maximum altitude of about 400m. About 3 km northeast of the town center, this trial joins the path of an old Roman Road. In this area, the trail passes by two Dolmens, one on a small peak just west of the D133 road, and one just to the east, ath the Col de l'Aubret. An interesting, but unmarked hike, follows local roads and forestry trails south-southwest, past the Puech de Mar hilltop (356 m) to the Roquefourcade area. Here you'll find the ruins of the original village and the ruins of an ancient chateau.